Tommaso Messina first appears at Painesville, Lake County, Ohio, in 1914. When he immigrated to the United States, his destination was Painesville, Ohio. Mr. Messina left his wife and three children in Sicily. In America, Tommaso Messina was known Thomas Messina. Tommaso Messina, son of Salvatore Messina, was born on Thursday, June 5, 1879, at Tommaso Natale at Palermo, Palermo Privonce, Sicily. Tommaso married Caterina Graziano, daughter of Francesco Graziano and Rosa Carolla, about 1906, at Sicily. Tommaso was widowed by the death of his wife in 1940. 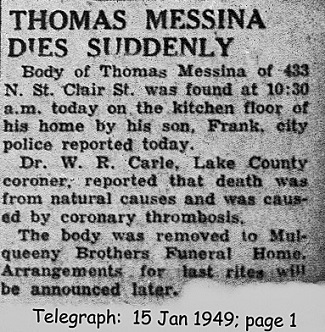 Tommaso Messina died on January 15, 1949, at his home, 433 North Saint Clair Street, Painesville, Lake County, Ohio, at age 69, of a coronary thrombosis. His body was interred at St. Mary Cemetery at Painesville Township, Lake County, Ohio. Tommaso Messina immigrated to the United States on April 16, 1914, at age 34. He was travelling to 203 Elm Street, Painesville, Lake County, Ohio, to join his brother-in-law, Giovanni Vassallo. Tommaso arrived in the United States at the Port of New York City aboard the ship SS Berlin. His name on the passenger ship manifest was Tommaso Mesfina. 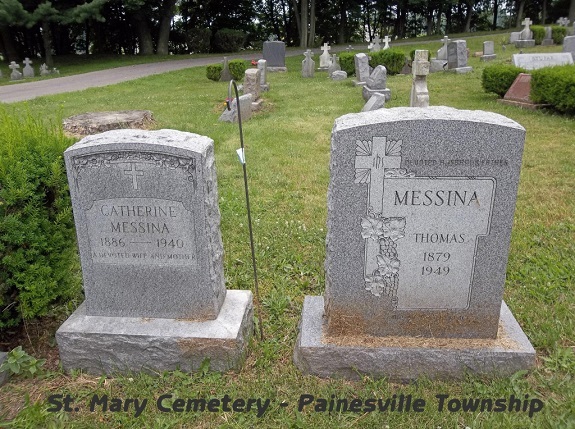 Mr. Messina’s wife and three children joined him in Painesville in 1916. Tommaso Messina registered for the World War I Draft on September 12, 1918. He was living at 221 Storr Street, Painesville, Lake County, Ohio. Tommaso Messina was enumerated for the 1920 Census of the United States, on January 13, 1920, living at 219 Storrs Street, Painesville, Lake County, Ohio, as a head of household. He was enumerated as Thomas Masina. Tommaso Messina was enumerated for the 1930 Census of the United States, on May 1, 1930, living at 431 North St. Clair Street, Painesville, Lake County, Ohio, as a head of household. He was enumerated as Thomas Messina. Tommaso Messina was enumerated for the 1940 Census of the United States, on April 4, 1940, living at 433 North St. Clair Street, Painesville, Lake County, Ohio, as a head of household. He was enumerated as Thomas Massina. Mr. Messina was employed by the Diamond Alkali Comapny from 1919 until his death in 1949. 1. Salvatore Messina was born on January 11, 1907, at Palermo, Sicily. He died on May 18, 1989, at age 82. 2. Francesca Messina was born on December 23, 1909, at Palermo, Sicily. Francesca married first, Michele Parmigiano, son of Vincenzo Parmigiano and Maria Petrecia, on April 3, 1935, at Cuyahoga County, Ohio. She and Michele Parmigiano were later divorced on January 21, 1952. Francesca married second, Joseph Dienes, son of Steve Dienes and Mary Komaty, on August 9, 1952, at Fairport Harbor, Lake County, Ohio. Francesca died on September 11, 2002, at Lake Med Rehabilitation Center, Painesville, Lake County, Ohio, at age 92. Her body was interred at Perry Cemetery at Perry, Lake County, Ohio. 3. Rosa Messina was born on July 20, 1912, at Palermo, Sicily. 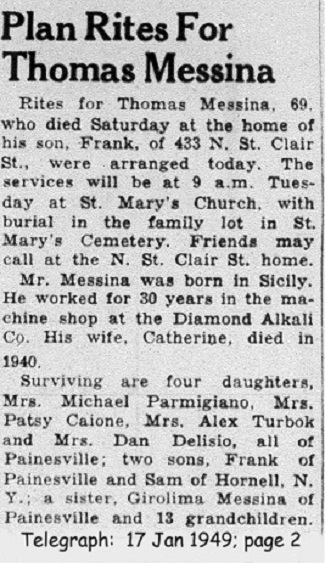 She married Pasquale Caione, son of Berardino Caione and Giovanna Calucci, on January 18, 1930, at St. Mary Catholic Church, Painesville, Lake County, Ohio. Rosa died on February 24, 1984, at Western Reserve Extended Care Nursing Home, Kirtland, Geauga County, Ohio, at age 71. Her body was interred at Riverside Cemetery at Painesville, Lake County, Ohio. 4. Beatrice Messina was born on April 6, 1919, at Ohio. Beatrice married Alex J. Turbok. She died on March 1, 1994, at age 74. Her body was interred at Riverside Cemetery at Painesville, Lake County, Ohio. 5. Frank L. Messina was born on June 5, 1921, at Painesville, Lake County, Ohio. Frank married Kathleen Gorman, daughter of James and Margaret Gorman, on July 31, 1948. He died on January 3, 2005, at LakeEast Hospital, Painesville, Lake County, Ohio, at age 83. His body was interred at Riverside Cemetery at Painesville, Lake County, Ohio. 6. Virginia Messina was born in September, 1923, at Ohio. Virginia married Dan Dilisio, son of Pietrantonio DiLisio and Maria Bucci, on January 26, 1946, at St. Mary Catholic Church, Painesville, Lake County, Ohio. Virginia Messina died on March 8, 2017, at the David Simpson Hospice House, Cleveland, Cuyahoga County, Ohio.